These days, I rarely go behind the scenes in our workshops here at the Science Centre, but for the upcoming harmonograph installation at our Festival of Numbers I got the opportunity to do just that. 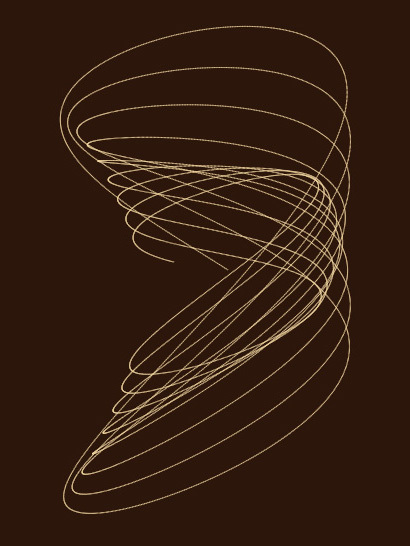 A harmonograph is a pendulum-driven drawing machine that combines two or more harmonic movements to produce beautiful patterns of graceful curves – provided a few conditions are just right. If either the design, dimensions or weights are wrong, you just get a jumble of lines. So for Probably the World’s Largest Harmonograph (PWLH) we want to make sure we get those conditions just right. The PWLH is a scaled-up version of the harmonograph exhibit we have in our FunFair Maths exhibition. 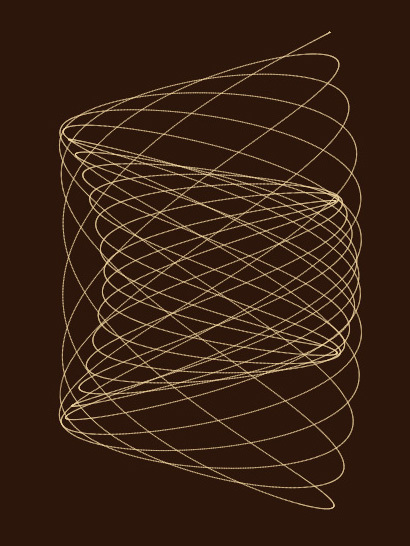 So my first step in planning for the PWLH was to create a simulation of this particular harmonograph design to help me understand how it actually works. I soon realised that the movement of the single horizontal beam suspended on two wires can be modelled as a single pendulum twisting about its centre point. To get some nice harmonograms (the images produced by a harmonograph), the frequencies of the oscillating twist and the pendulum motion need to be almost (but not exactly) the same or a factor of two or three different. And the damping of these oscillations – how fast they slow down – needs to be as little as possible. In the physical harmonograph, the frequencies of the pendulum and twist depend on the length and placement of the wires and the weights and their placement along the beam. So we had to design the prototype such that these factors can be adjusted easily. Once our prototype was installed in the workshop, we could start experimenting and adjusting these settings. One of the first test drawings by our prototype, using a marker pen. Note how quickly the twist oscillation dampens. 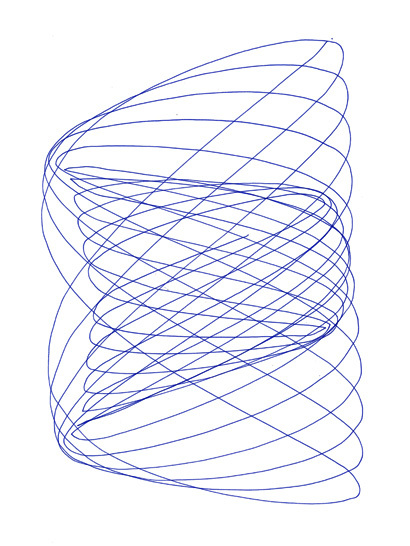 The closest we could get to the same drawing with the harmonograph simulation. Another prototype drawing, with a thinner felt pen that produces less friction. This reduces the dampening of the oscillation, but note the kinks in the lines created by the thin pen jiggling in the holder. 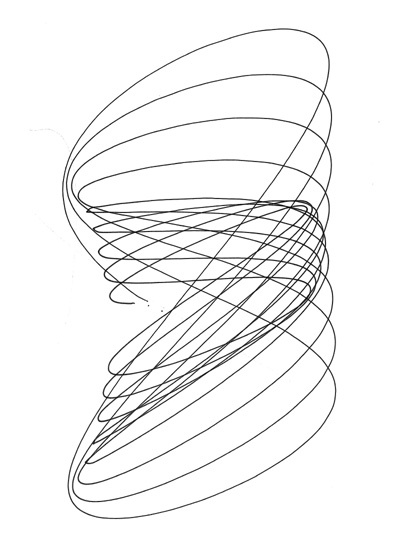 Output from the simulation that comes closest to the second drawing. It looks like both the prototype and the simulation are working well. The next step now is to install the PWLH in the exhibition hall with its much higher ceiling (which is what makes this ‘probably the world’s largest’ harmonograph…). In that new setting, we’ll have to fiddle with the weights again, but we are confident that we’ll get it to work just beautifully. Come and have a go at creating your own mesmerising drawing with Probably the World’s Largest Harmonograph during the Festival of Numbers on 11-19 March 2017! And check out the online simulation to practice with different settings first. Next articleCAMPS AND FESTIVALSA great cause for celebration! This is pretty cool! learnt sth new today.